Whew! I lucked out of a bath review again. I mean that just because I don’t like getting a dog bath. My friend Sango bailed me out on this dog shampoo review. Thank you, Sango! Pop’s Pet Organics was kind enough to send Mom a bottle of their Lemongrass & Neem Insect Away Pet Shampoo. If you have been following Mom and me, you know that we practice a safer, less chemical way to keep flea and ticks off of me. You can check out Mom’s article on Safe Flea Control here. Pop’s Pet Organics Insect Away Pet Shampoo has naturally-extracted lemongrass and neem oils which are known to repel fleas, ticks, and other pesky insects. You can even wash your dog’s collar in it for extra repelling action. Of course, it has other great ingredients for a good dog shampoo. 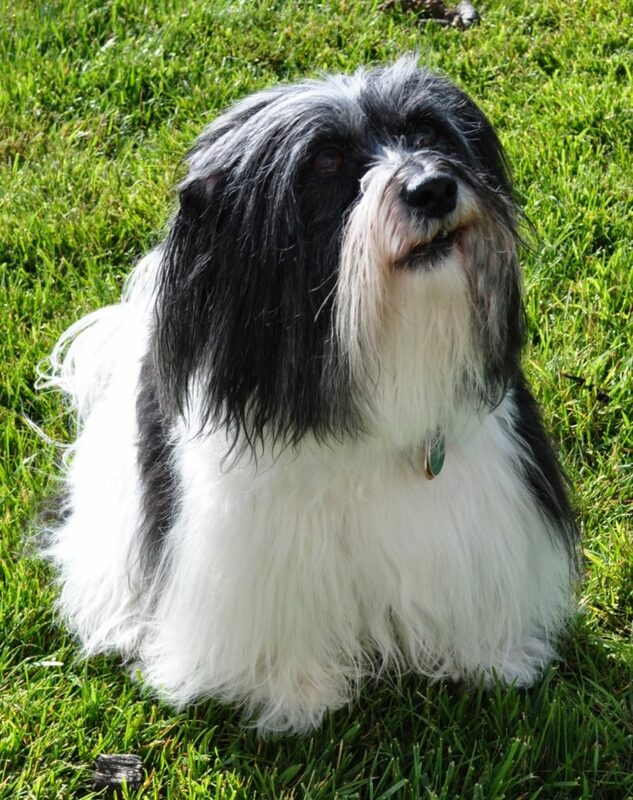 Sorry, Sango – time to give Pop’s Pet organics Insect Away Pet Shampoo a go. Sango’s Mom said it had a nice lather and a fresh scent, and felt good during Sango’s dog bath. She wasn’t used to the liquid type dog shampoo, so squirted a bit too much out and missed her hands. That will happen. So, know the shampoo isn’t as thick as you might be used to. The Pop’s Pet Organics Insect Away Pet Shampoo rinsed off well, but had that sticky feel. This is common in some non-toxic shampoos and something you might need to get used to. But no need to fear, the bath water rinsed clean and all the shampoo rinsed out well. Once Sango was dry, she had a smooth, soft texture, not sticky at all. Her Mom was very happy with the results of the Pop’s Pet Organics Insect Away Pet Shampoo. Sango felt very clean, fresh, and soft to the touch. Her fur did not get staticky like it normally does without a conditioner, and she has not been knotting as usual. Sango’s white came through brilliantly and looks great and still smells great! Now it’s time to look at Pop’s Pet Organics Insect Away Pet Shampoo ingredients and benefits. A nice, safe alternative for flea and tick control. Nontoxic, no harsh detergents or chemicals, vegan and cruelty-free, made in the USA. Made with Certified Organic Oils and Naturally Extracted Botanicals. Not bad!Ingredients: Saponified organic coconut, olive and jojoba oils, natural essential oil blend including naturally extracted lemongrass, neem and catnip, organic aloe vera, and naturally extracted rosemary as a natural preservative. 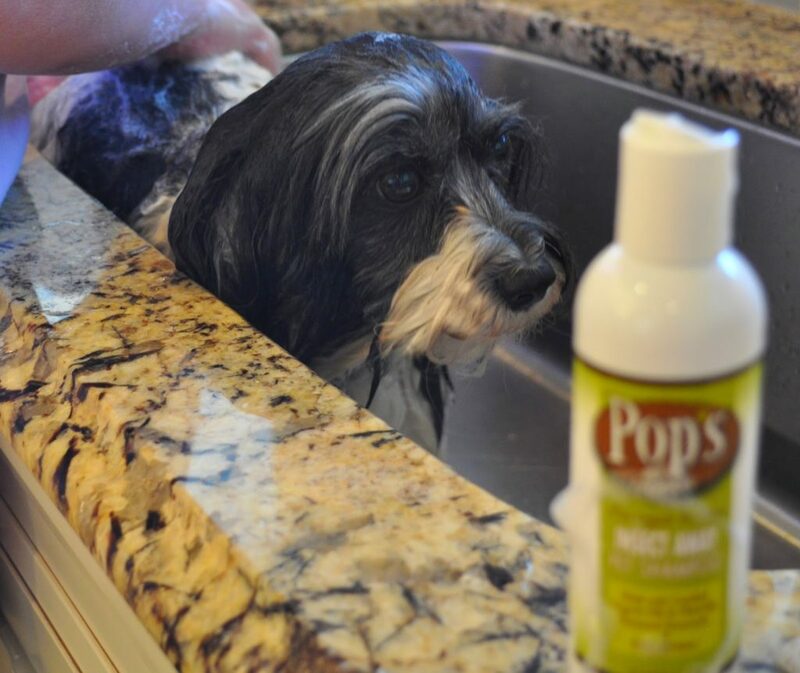 Pop’s Pet Organics Insect Away Pet Shampoo is a paws up in my book! Thank you again Pop’s Pet Organics for allowing us to review your shampoo. Need help bathing your dog? 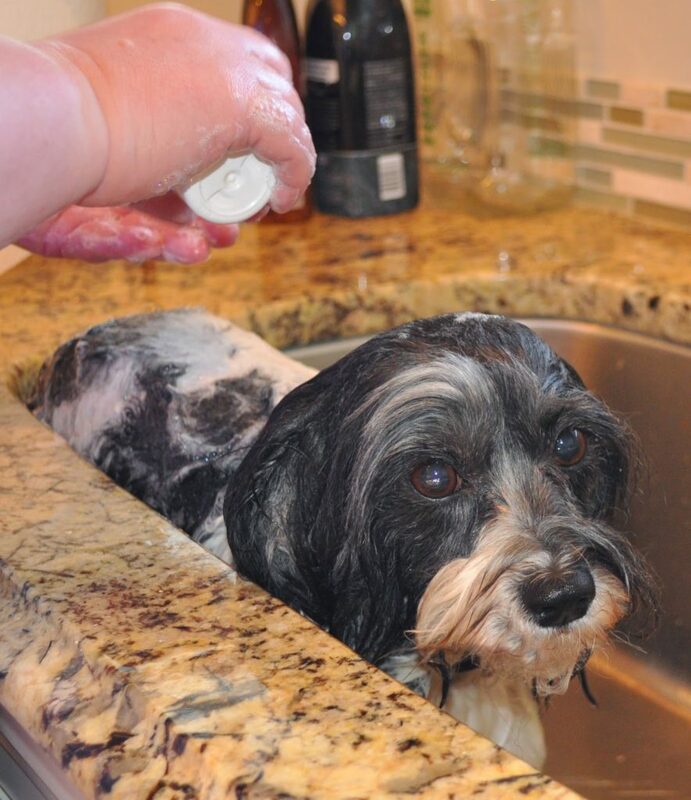 Check out our post on-How to give a dog a bath.